This entry was posted in Reflections and tagged #etmooc, #kinderchat, Alec Couros, Blackboard collaborate, communities, connected, connected learning, connectivist, consider, Early childhood education, education, Educational technology, examine, global education, Google, Idea Sketch, IPad, Joichi Ito, learning, mind map, MindMeister, network, nodes, permeable, Personal Learning Network, PLN, reflect, representation, sharing, SIGELT, sketch, teaching, Twitter. Bookmark the permalink. Thanks Sheri! I’m glad you found it as well and I’m looking forward to visiting your neighborhood too. Wow, Maggie, this is so cool! I am not a mindmapping person, which is weird, because I do enjoy visuals, but this exercise is definitely a testament to the complexity of learning networks and how everyone’s network is organized differently to meet their needs. However, at the heart of all learning networks, are people and relationships! Thanks so much for sharing this! Thanks Lyn! Even as a visual person, sometimes I feel like mindmaps aren’t a good fit because they aren’t very pictorial (it’s more about words and cookie-cutter bubbles) and they often feel a bit constrained to me, which is one of the reasons I walked away from Mindmeister and Idea Sketch – I wanted more freedom for expression. I’m glad we’ve been able to connect and I’m looking forward to learning with you! I really enjoyed reading your thinking process as you worked out the mindmap. Like Lyn, above, I am not usually a mind map person but this has given me some encouragement to try and think through my own PLN, how it works, and how I can tweak it. I enjoy sharing and learning through my social media networks but I am developing specific goals and I think I need to focus on how to achieve them. Thanks for this. I’m glad my PLN sketch could provide some encouragement and I’d love to hear more about how you conceptualize your own PLN. 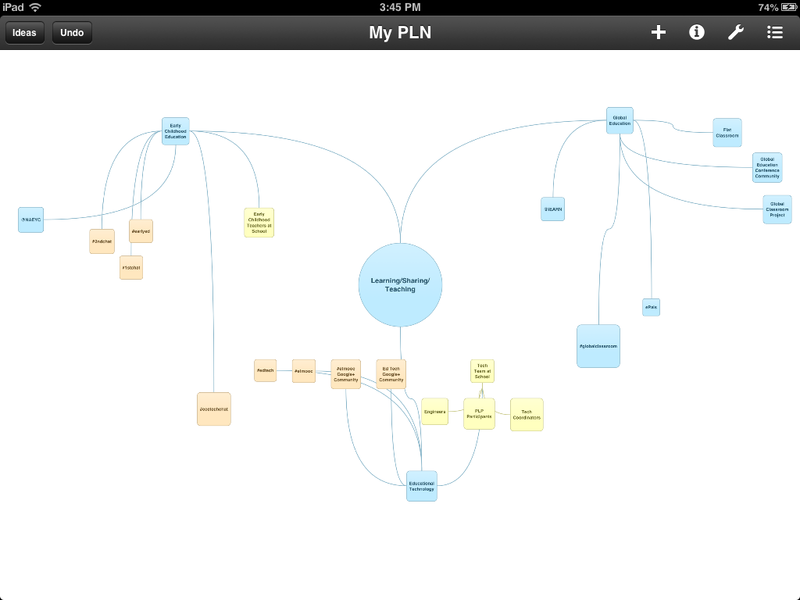 I have been learning so much from seeing and reading about people’s various ways of mapping and defining PLNs. I also like your idea of having specific goals. I try to set them at various points in the year but I also sometimes lose sight of how to implement/achieve them. Thanks for your comments! The thought put in to this is great. 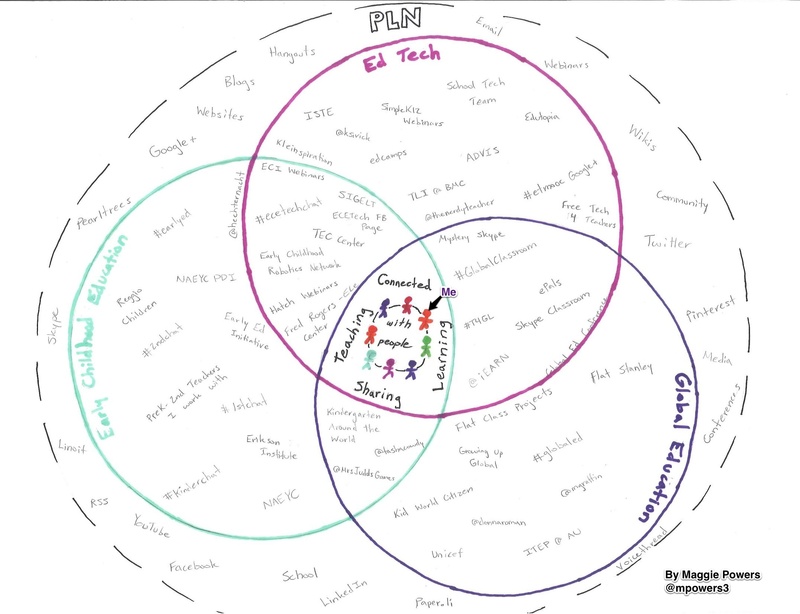 It helps visually define a PLN – something many of us need. The word definition leads to so many questions about how – concrete type things. This visual lets the rest of see/reminds us how intensely personal (simultaneously external) a PLN can be. Also motivational is how you’re using your visualization as a tool for improvement. I’m not #etmooc-ing right now b/c of other time commitments (NSTA new(ish) teacher program) but I appreciate your sharing with us your learning/reflection/growth. In the manner of so many other connected educators, I think I’ll “steal” it! Thanks Keri! I usually work better with visuals because that’s how I often conceptualize things in my head. Many of my ideas have a 3D mental form so putting them on paper helps that visual to grow, deepening my own understanding of it. I’ve been reflecting on the personal yet external nature of PLNs as well and trying to work through how to really draw or find the words to describe that intersection. I know the idea of neighborhoods has been circulating but I think my view of a PLN is closer to an Italian village on market day – full of people you know (family, friends, confidants) yet bustling with an endless flow of new activity and visitors. Thanks for sharing your thoughts and stopping by my blog! Well done, Margaret. You’ve given me several new ways to think about this important topic–beginning with your insights into connected learning and teaching and sharing! Interesting use of mind-mapping software as well! Thank you. Thanks Julie! I appreciate hearing that and I hope we can connect to learn and share together. Pretty interesting map. Great way to reflect upon where you want to go in your learning. This is my next step. Putting it on paper, understanding who I need to pay attention to and who to ignore and what I need to share in order to be a benefit to others as we learn and grow. Thanks Margaret!